Card Counting Systems - Myth or Reality? The card counting systems is based on math approach to keep the traces of all the cards were dealt form the playing deck. The main purpose is to know the rest of the cards which are still in the deck. Does it work? Ask the blackjack card counters who are banned to play in the casinos all over the country. Those fellows who possess faked beards, large sunglasses and sizeable bank accounts. Is it possible to master card counting systems for an ordinary person? Just patience and practice - is our answer. No academic grade in math or science activity experience. The card counting systems mechanism deals with the ability of a player to keep in mind the cards which are already dealt. Mean the cards of all players + the dealer ones too. Thus the player provides himself with a very helpful info - which cards are still there in the shoe. 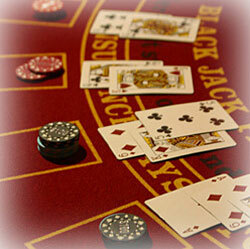 Possessing this info the player may plan his betting pattern in accordance with either positive or negative count. By-turn the positive count means the smaller cards have already been dealt and more percent of large cards is still in the shoe. The player initial hand is stronger, with higher cards. The player should possess higher stakes when the count is high 'cause the winning chances increase. And vice-versa, if the count is negative and the lower cards prevail is in the shoe - then you must minimize your bets. Still in both variants the card counting systems usage must proceed. HOW TO MASTER THE CARD COUNTING SYSTEMS? To our mind the answer is obvious and clear. Patient and consistent practice is the only way to master and employ the card counting systems. It must be mentioned that player shouldn't perform blackjack gaming the time he wants to practice considered technique. For beginners is the best way to start with basic card counting systems variations. It may be either KO count or Hi-Lo count technique. These systems are usually the simplest to learn. Only after that the player may proceed to more complex systems to master. That time he will be able to choose the most suitable and favorite one. Firstly we do not advise you to use card counting systems playing in the live casinos. From the law point of view this technique is okay. It's your brain and you may use it whenever you like, isn't it? But if we a talking about the private property rights - there is no alternatives to discuss. Every casino has a clear right to turn out any person who is suspected in CCS usage with no chances to return a day (month, year) later.